Showing 1–10 of 1,659 items. 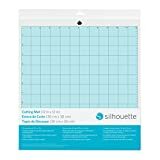 The Nicapa cutting mat use for Silhouette Cameo 3/2/1 [Standardgrip,12x12 inch,3pack]. The standardgrip Nicapa cut mat for Silhouette Cameo 3/2/1 is a multi-purpose mat that is perfect for wide range of medium-weight materials, including: Cardstock,printable Iron-on,Glitter Cardstock,Pattern paper,Pearl Paper,Vellum,Printer Paper,Vinyl,Glitter Iron-on,Handmade papers,Washi Sheets,Craft paper,Thin fabrics,Embossed Cardstock,Light Cardstock,Printable Sticker Paper,Construction Paper,Window Cling,Printable Fabric etc. Each Nicapa cutting mats for Cricut has the proper tack to hold your material securely in place during the cutting process and allows easy removal of material; to meet your needs and let you experience the best results. The Nicapa StandardGrip cut mat for Cricut is a multipurpose mat that is perfect for a wide range of medium-weight materials, including: Cardstock,printable Iron-on,Glitter Cardstock,Pattern paper,Pearl Paper,Vellum,Printer Paper,Vinyl,Glitter Iron-on,Handmade papers,Washi Sheets,Craft paper,Thin fabrics,Embossed Cardstock,Light Cardstock,Printable Sticker Paper,Construction Paper,Window Cling,Printable Fabric etc. 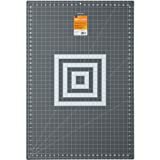 Keep the clear film cover on the cut mat for cricut when storing to keep mat free from paper scraps and dust. Use the scraper to scrape away excess pieces and the spatula to carefully remove cut images. 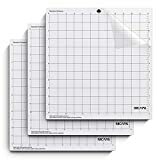 Nicapa Heat Press Mat for Cricut Easypress 12" x 12" size ideal for smaller projects like baby clothes, accessories, hats, and more. Nicapa Heat Press Mat designed for heat transfer engineering.Thick,High-quality and Heat-resistant innovative construction eliminates moisture and directs heat to your iron-on design. Provides a smooth surface for a perfect ironing transfer. Shields your work surface from damaging heat and moisture. 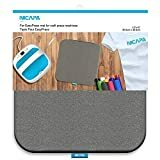 Nicapa Heat Press Mat for Easypress also perfect for pressing sewing projects. 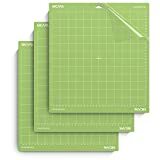 The Nicapa cutting mat use for Silhouette Cameo 3/2/1 [Standardgrip,12x24 inch,3pack]. The standardgrip Nicapa cut mat for Silhouette Cameo 3/2/1 is a multi-purpose mat that is perfect for a wide range of medium-weight materials, including: Cardstock,printable Iron-on,Glitter Cardstock,Pattern paper,Pearl Paper,Vellum,Printer Paper,Vinyl,Glitter Iron-on,Handmade papers,Washi Sheets,Craft paper,Thin fabrics,Embossed Cardstock,Light Cardstock,Printable Sticker Paper,Construction Paper,Window Cling,Printable Fabric etc. 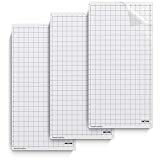 Keep the clear film cover on the mat when storing to keep mat free from paper scraps and dust. Use the scraper to scrape away excess pieces and the spatula to carefully remove cut images.